Lebanese, Syrian sources claim airstrike by either jet or drone killed a number of regime militiamen in Syrian Golan Heights. Syrian and Lebanese sources are claiming an Israeli airstrike has killed several pro-regime forces in Syria. According to the pro-Hezbollah Al-Mayadeen, an Israeli airstrike hit a vehicle in Quneitra in the Syrian-controlled Golan Heights, close to the border with Israel. Hezbollah's official Al-Manar TV station claimed two pro-regime militiamen were killed in the strike, which it claims was carried out by an "Israeli drone." The station reported that "two members of Syria's (pro-regime militia) National Defense Forces were killed when an Israeli drone targeted their car at the entrance of Hader, in Quneitra province." Meanwhile, the Syrian Observatory for Human Rights said a total of five pro-regime fighters were killed in the strike. "An Israeli plane hit a car inside the town of Hader, killing two men from Hezbollah, and three men from the pro-regime popular committees in the town," said Rami Abdel Rahman, director of the Syrian Observatory for Human Rights. Hader is a Druze village that lies along the ceasefire line, with the Israeli Golan Heights plateau to the west, and the border with Damascus province to the northeast. The IDF has yet to comment in the report. Israel has largely maintained neutrality in the Syria civil war, eager to avoid being sucked into the bloody chaos north of the border. 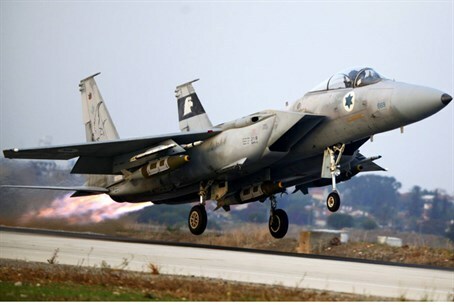 However Israeli jets have carried out several airstrikes in Syria, targeting sophisticated Iranian and Assad regime weapons destined for Hezbollah, as a reward for the Lebanese Shia terrorist group's support for Damascus during the civil war.